Making Cornish Game Hens is super simple with this sheet pan method. 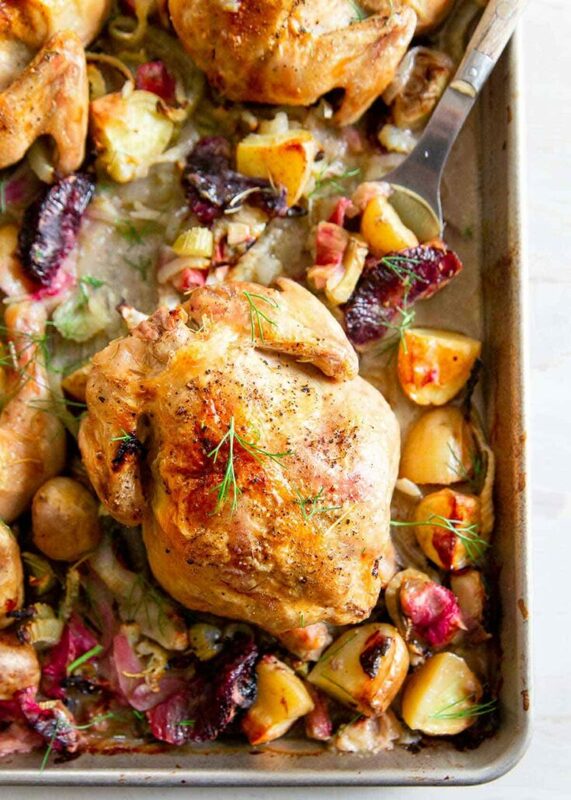 Rhubarb, blood oranges, fennel and potatoes are roasted with the Cornish Hens all on one pan for an easy spring dinner versatile enough for a weeknight or a holiday! I wasn’t totally wrong, Cornish game hens are in fact a specific breed of chicken but that was the first time I learned of these tasty little birds. I think Cornish game hens are highly underrated for some reason and I don’t quite understand why. Everyone seems to love a good roasted chicken, it’s the perfect Sunday dinner, it can be dressed up for a special occasion or down for normal meal and there’s really nothing much to it. Some oil/butter, a liberal seasoning of salt and pepper and you’re good to go. Cornish game hens are essentially the same as that classic roasted chicken just in a smaller (cuter?) package. In fact, that’s part of the reason I love Cornish hens so much. Each hen is about 1 serving so everyone gets their own and there’s no fighting over dark vs. white meat. They also cook much faster so dinner can be ready in about 45 minutes compared to 2 hours for a larger chicken. Amen to that when you’re hungry, right? I’ve made stuffed Cornish hens before (with cranberries and apples it makes a great Christmastime meal) but this time around I decided to go an even easier route and make sheet pan Cornish hens. Everyone loves a good sheet pan meal like sheet pan Mediterranean lamb or sheet pan maple mustard chicken because it makes dinner clean up an absolute cinch. 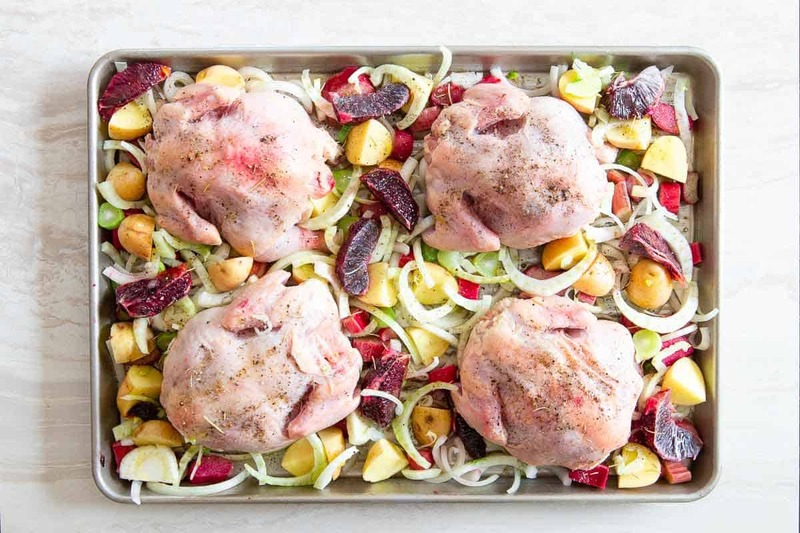 And while I usually think of sheet pan meals for easy weeknight dinners, this sheet pan Cornish game hen recipe proves they can go the fancier route too. 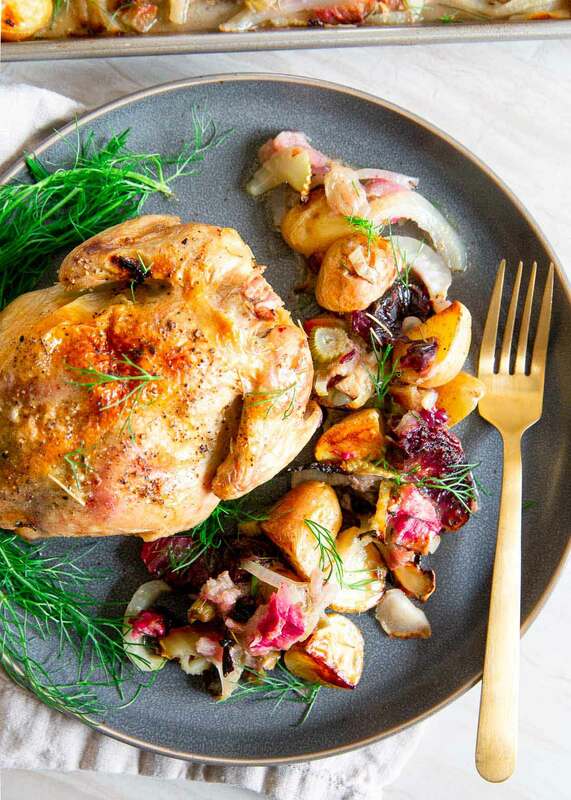 With blood oranges, fennel, rhubarb and potatoes perfectly roasted alongside the crispy skinned game hens, this spring dinner is packed with flavor. You know how the vegetables surrounding a roasted chicken soak up all the juices from the chicken as it cooks and become super tender before caramelizing to a sweet bite towards the end? The same thing happens on the sheet pan with the potatoes, fennel and rhubarb but with a lovely citrus undertone from the blood oranges releasing their juices on the pan as well. It’s savory spring dinner perfection. Like any sheet pan meal, everything gets loaded onto a large baking sheet (make sure to use a heavy duty large one – I love my USA half sheet pan for meals like this because it doesn’t warp like many others in the heat) and roasted at the same time. We’re using a pretty high heat of 450°F but that helps get the skin of the Cornish hens nice and crispy and a nice caramelization on the potatoes, fruits and vegetables on the pan as well. Make sure to liberally season the Cornish game hens before roasting. Since the only ingredients are olive oil, salt and pepper on the game hens themselves, a proper seasoning (make sure to get inside the cavity too!) makes a big difference. It’s also important to toss the ingredients around the hens a couple times while roasting to make sure they cook evenly and the oil and juices get dispersed throughout. What size should the Cornish hens be? Typically the Cornish hens you find in the store are about 2 – 2 1/2 pounds each and come 2 in a package. Cooking time may vary if your hens are a little smaller or larger so adjust accordingly. If you hate rhubarb (I know some people do), leave it out and use more fennel. Use any potatoes you like, just make sure they’re cut into a similar size. If blood oranges are out of season, use a regular orange or even grapefruit segments. Hate fennel (another divisive vegetable)? Leave it out and use more onions and rhubarb. 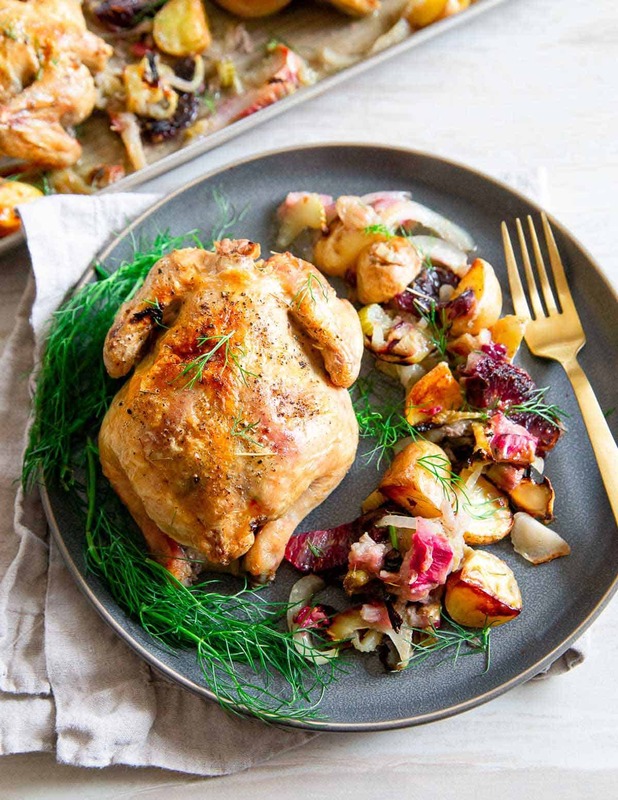 It’s an easy Cornish game hen recipe and adaptable for pretty much any assortment of ingredients, I just love the spring vibe this combination has for this time of year. I know many do ham on Easter (don’t miss 3 ways to use leftover ham if that’s you!) and while I don’t mind ham, it’s never usually something I crave or would pick if given the choice. This easy sheet pan roasted Cornish game hen recipe would make a lovely Easter dinner option. With Easter being almost a month into spring this year, it’s packed with bright flavors and ingredients to celebrate the season while being incredibly easy to prepare and cook. Which leaves you plenty of time to make dessert instead (like some lemon macaroons or lemon thyme mini cheesecakes)! Looking for more meals like this game hen recipe? Try Grilled Pork Chops with Grapes and Fennel, Apple Butter Roasted Chicken, Maple Ginger Chicken Thighs or, Goat Cheese Fried Chicken with Cherry Tarragon Sauce. Making Cornish Game Hens is super simple with this sheet pan method. 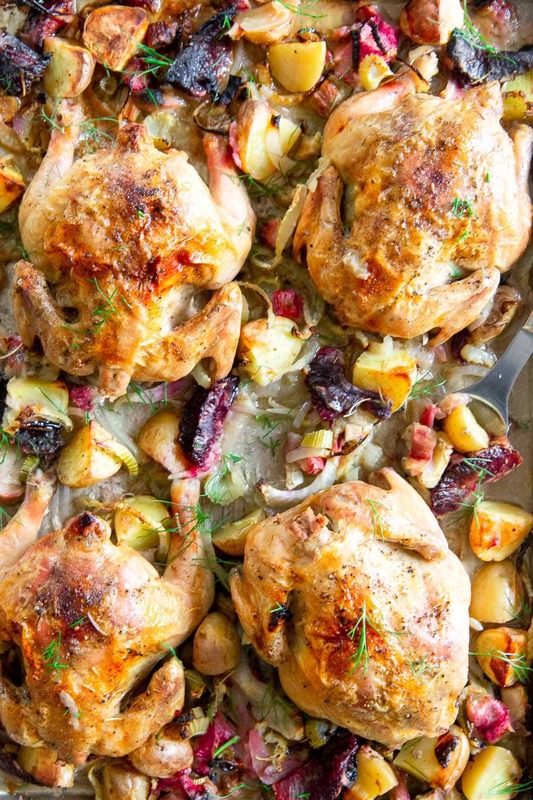 Rhubarb, blood oranges, fennel and potatoes are roasted with the game hens on one pan. Pat Cornish Game Hens dry with a paper towel, drizzle with olive oil and season liberally with kosher salt and freshly ground black pepper. Place on a large, heavy duty baking sheet. 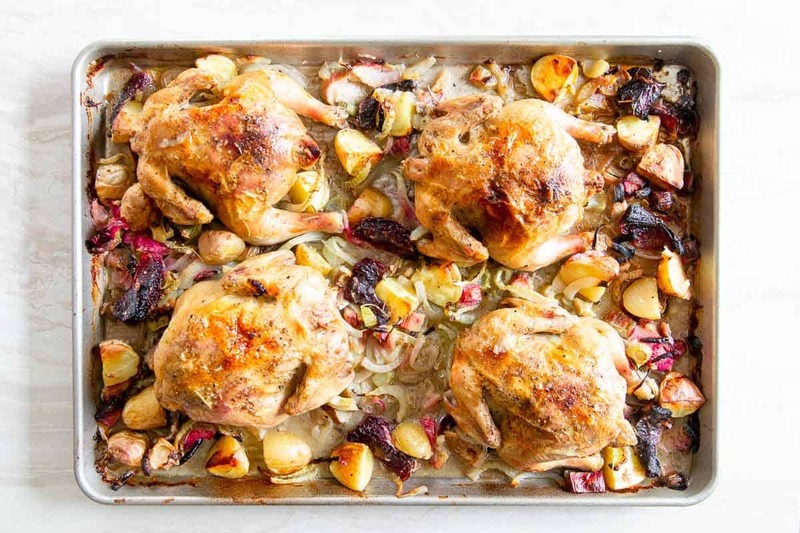 Arrange the onion, rhubarb, potatoes, blood orange and fennel around the Cornish hens on the baking sheet in an even layer. Drizzle with more olive oil, season with salt and pepper and sprinkle the rosemary all over the ingredients. Place in the oven for 40-45 minutes, tossing vegetables 1 or 2 times during cooking. Broil for last 2-3 minutes for a nice golden brown on the skin of the Cornish Hens. Remove from oven, cover and let sit for 5-10 minutes before serving. We all loved having our own personal roast chicken! So awesome! Looks delicious. Never had cornish hens before so it will be awesome to try out.